Let’s go over the differences in referral marketing, advocate marketing, ambassador marketing, influencer marketing, and relationship marketing. Every day we hear a different term used in the referral marketing world. Whether it be advocate marketing or influencer marketing, it all becomes very confusing. Especially when other terms like influencer marketing and relationship marketing are have introduced as well. When is the right time to use a specific term, and are these terms really interchangeareble? Well, to be honest, many companies decide which referral program term best suits them. They also decide on what terms to use for their customers (advocate, ambassador, rock-stars, etc.). So chances are you’ve heard a company call their customers one of the many terms used when discussing customers who advocate for their brand. Some of the most common include ambassadors, influencers, and advocates – which are all related terms in the marketing world. Though each term does relate to a specific type of marketing, the terms are often used interchangeably throughout all market types. Let’s go over how each of these types of marketing differs from one another. We’ll later discuss how they have been used as related terms. You probably have heard of brand advocates. You may even see countless advocates talking about specific brands and retailers on social media. Perhaps you have even done it yourself, advocated for a brand you love. Advocate marketing actually happens naturally on its own because people like sharing good things with their friends. What is Advocacy or Advocate Marketing? 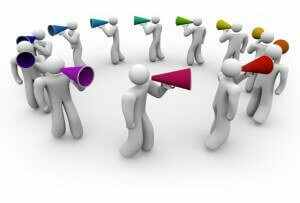 Advocacy marketing is a type of marketing that encourages existing customers to create a buzz for a company. 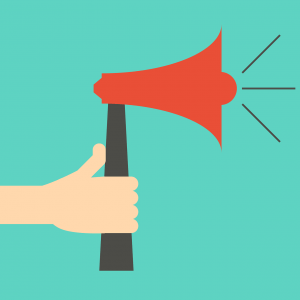 It’s the megaphone of word of mouth marketing – meaning super happy customers do super bragging on the business’s behalf. It takes the topmost passionate customers and uses them to spread the word about a brand or a specific product. Advocates will typically share or motivate others purely by how excited they are about the brand or product. An advocate can really be anyone who loves your brand. Why Use Customer Advocacy Marketing? Why does this work? Well, to start off most advocates will do this without anything in return. Typically, an advocate will share because they genuinely like the brand or product. Usually, the advocate who is sharing is largely respected in their community or network. Because of this, the followers trust the advocate’s opinion. They are intrigued to try the brand/ product for themselves. Not only are they intrigued to try the brand, but they may also see how they can benefit from it. Let’s take a look at this in the perspective of an advocate. Perhaps the person has a blog or a website that caters to a certain type of individual. Typically the individuals who follow the blog are in a similar boat or seek guidance, ideas, and advice from the blog owner (advocate). The advocate will mention this product to their followers. Then the followers will then know about the product and perhaps may try the product since someone they trust has spoken highly of it. The thing is, people, search for reviews before committing to a product. Whether it be a software, electronic or even a type of beauty cream. People watch and read reviews online, on top of getting advice from their friends and family. We’ve heard many times that people tend to trust their friends and family the most. In a study by Nielsen, it was suggested that a whopping 66% of people trust the opinions of consumers found online. Meaning, advocate marketing can definitely drive new customers. In fact, a lack of customer advocacy could result in lackluster consequences. How do you find brand advocates? Because customer advocacy marketing is based on trust, it can seriously benefit a company. The best news is that advocacy marketing is actually quite inexpensive. It’s not like influencer marketing, which is based on influencers having a vast amount of social media followers, it’s more about having someone who actually likes your brand. In fact, it’s also the easiest to use, because it uses the people who are already promoting you. Think of it like peer to peer marketing. You’re having customers engage other customers in buying your products. Buyers simply trust other people in their situation, or friends and family. This is the exact reason peer to peer marketing and customer advocacy marketing work so well. Well, it’s actually pretty easy to find a few people who already love you. Social Media – Look at who is talking about you on the web. Whether it be social media or a positive review on a listing site. These people are already talking highly of you, make them an advocate. Email Correspondence – You may have had a few pleasant emails come in. Think about it, those who want to provide you with a testimonial make great brand advocates. NPS Scores – Perhaps you sent out a recent survey, turns out these people basically told you that they would recommend your brand to others. Recent Interaction – Think of recent phone calls or face to face interaction where the customer expressed gratitude or excitement for your brand. These customers are also great advocates. As you can see, these people who are praising your business may not have the most followers on social media but what they do have is a passion for your brand. These are the people who will support you and help you because they believe in your business and love your product. Okay, so this is where it gets a little different from the traditional referral marketing. Advocate marketing isn’t based on spreading the word because someone was provoked by an incentive. However, this type of marketing can’t be a one-sided relationship either. This doesn’t mean incentives have to be as clear-cut as something like referral marketing, but brand advocates need to be shown appreciation too. Whether it be a physical reward or a little bit of recognition, it can go a long way. This could mean sending the advocate a t-shirt for adding a link to your website. It could also mean expressing how awesome they are via a Tweet or a Facebook post. This type of appreciation doesn’t need to occur all the time, but frequently enough so that they want to continually promote you. As you can probably tell by now, this type of marketing basically occurs on its own as word of mouth. It takes people who are already promoting you and gives them a reason to continually support you. Making it an inexpensive marketing alternative. In the referral marketing world, we’ve established that there are a ton of terms that all have a similar meaning. But what do you think of when you hear the term brand ambassador or ambassador marketing and how is a brand ambassador different than an influencer or advocate? Ambassadors are actually very helpful when it comes to spreading the word about your business. Not to be redundant, but word of mouth is very effective. So what makes ambassadors different is that they encourage people to use your product or do business with you because they are an influential person. This person represents your brand and is able to discuss your brand to the public. They are basically seen as a brand expert. It doesn’t mean they are telling people to ‘try this’, ‘buy this’, or ‘use this’. They are using the product themselves and simply expressing why they use it. Who is a brand ambassador? They are real-life humans who use your product and believe in what your brand is doing. This could mean an ambassador is an employee, it could also mean it’s a partner or even a customer. These people are working for you to help spread your message via social media, trade shows, events and just by networking for you. Why? Because they love you. They’re just like you and they want to see the business do well. Talk about top-notch cheerleaders. Think of a brand ambassador basically being an informal spokesperson. Or someone who was hired to actively promote the brand, without being too stuffy. Rather than having a formal press release or speaking based on a script (though there may be a few guidelines to follow), these people like to get right in the action and talk to people one on one. As mentioned earlier they aren’t trying to push anything, they are rather expressing their fondness while being informative about the product/brand. They are the people who put a face to the product. Because of the viral nature of the web and word of mouth, brand ambassadors can easily become your online and in-person brand representation (can you say ‘cost-effective’?). They give new customers a reason to trust you. Not only do they send new customers your way, but they usually end up as a lifelong customer. It should be noted that brand ambassadors can earn incentives. Often times this is the reason why they are motivated in the first place. This is not necessarily required, though (but, who doesn’t love company swag?). Influencer marketing is when someone who is considered an ‘expert’ in the field, has a high reputation markets your product. These people may also be considered popular in certain markets and may then be seen as a knowledgeable source. Influencers typically have a sway over the things their followers buy. They influence by example, more so than using word of mouth to explain why someone should buy the product. What does it mean to use influence over word of mouth? Well, it means that these people are not strictly saying “you have to try this”, “you’d like this”, “you need this”. Instead, they are simply showing off how they use the product. You may notice when certain celebrities or other people who have a large following to promote certain products or brands on social media. This is sort of like a celebrity endorsement. There are plenty of awesome things associated with influencer marketing. Really the only things you may spend money on is providing some sort of incentive to the influencer. Usually, this is a free product or discount. Or you may choose to supply the influencer with some inventory to give out to people. For example, a makeup artist may receive a sample of makeup to show off in a tutorial, and they may receive a few other samples to give to their followers. Just as an athlete may receive some sports drinks to hand out to fans. Depending on how much product you give to the influencer, things could get expensive. But, overall, it’s a less expensive way to market your product in general. You’ve heard of a lot of different types of marketing. We have email, referral, affiliate, inbound, you get the point. One type that you may know about but often flies under the radar is relationship marketing. So what is relationship marketing? Well, it’s relative to customer relationship management. The purpose of it is to produce long-term customer engagement. Or better yet, the purpose is to create loyal customers (hence the word relationship). This loyalty not only produces return customers, it feeds into other marketing types like word of mouth marketing. To sum it up, it’s all about creating a great relationship with your customers and using that to move your business forward. So, why relationship marketing? Relationship marketing focuses on increasing the number of sales per customer. How is this different than typical marketing? Well, it takes the steps to create repeat buyers versus creating new buyers. It instead works as a way to enhance customer experience and interactions. This is especially true for communication via the web. Relationship marketing means creating a good flow of business. The idea is, the easier you make it for the customer to shop with you, the more likely they are to do so. This is where tracking customer information and interactions come into play. You may need to track what merchandise is in a customer’s cart so that you can send a reminder to complete the sale. It’s also helpful to store and organize customer information. When a customer creates an account and is able to store their information it makes future sales a breeze. Not only do you need to make it easy for customers to use you, you need to make it easy for them to reach you. communication is key. When you have stored information it allows for further communication of similar items. Making it convenient for you since you know the customer likes and their information. It also makes it nice for the customer because shopping with you again would be easy. Note: a good CRM can come in handy for tracking all this customer information. Multi-channel marketing – reach customer via email, social media, flyers, etc. Communication – but not too much or too little. Make their ‘job’ easy – whether it be checking out or sending a referral. (This is why some people love eCommerce, they can keep their credit cards on file, and make quick purchases). How do these different marketing terms relate? As previously stated, these types of marketing have been used interchangeably. A lot of businesses name their referral programs with the term ambassador or advocate in the headline. It doesn’t necessarily mean that is a true ambassador or advocate program. Most referrers in a referral program are called an influencer, advocate or ambassador more often than not.